One of the best boats for skinny and fast water operations bar none! 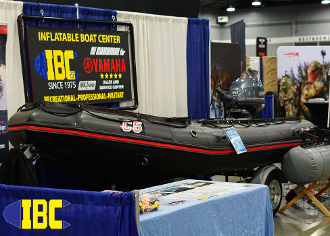 The Bombard Commando C-5 is already one of the most capable boats afloat today and one that our fishing and adventure guides wait on a list to get rigged up at IBC. This particular boat is also a favorite amoungst fish and wildlife scientists in the field doing surveys in extremely remote locations. Suitable for fastwater rescue and enforcement the jet spec Commando gets the job done and asks for more. We have exactly one unit in this configuration available for purchase so don't wait or you will be added to the wait list to get another one! Boat will come rigged on a trailer and ready to go (local pickup only) for the lucky soul who gets his/her order in first. Delivery will take at least a week once your order is placed to allowing IBC's Special Boat Division to rig you the very best boat possible. Includes a jet strake mod for superior performance. All Special Boats Division boat packages are rigged at the time of order and may take up to four weeks to shipment/delivery.